America Recycles Day (ARD) is on Friday, Nov. 15, 2013, and its spirit is celebrated throughout November and December. What can we do as individuals and as a community to support the goals of ARD in increasing recycling and improving the environment? Waste Management of the Antelope Valley offers tips to residents on how to recycle often and how to recycle the right way. “We want to spread the word about recycling each and every day of the year, and America Recycles Day provides a window in which to do this by encouraging environmental stewardship,” said Sandra Pursley of Waste Management. Take a moment to stop and think before you toss. Almost anything you throw away can be recycled in some way – paper, plastic, aluminum, food waste, glass, and even electronics. Please review Waste Management of the Antelope Valley’s recycling guidelines. Get creative. Think about new uses for cans, bottles and paper. These materials are perfect for art projects. Raise awareness. Be a recycling ambassador in the Antelope Valley and promote good recycling habits wherever you go. Tell your friends and family to recycle more items and to recycle them the right way. Recycling one aluminum can saves enough energy to run a light bulb for 20 hours, a computer for three hours or a TV for two hours. Recycled aluminum can be turned into pie pans, house siding, small appliances or even lawn furniture. Every ton of plastic bottles recycled saves about 3.8 barrels of oil. If every household in the U.S. recycled just three more plastic bottles, we could divert more than 23 million pounds of plastic from our landfills and increase the amount of recycled plastic used to manufacture new bottles. The message can be simple, Recycle Often. Recycle Right.You can share this message 365 days a year within your local community. You can also encourage residents to share the creative ways they recycle on Facebook: www.Facebook.com/WasteManagement or www.Facebook/AmericaRecyclesDay. To find out more about what materials can become if they are recycled the right way; visit iwanttoberecycled.org. 13 comments for "America Recycles Day"
If you don’t want someone digging through your can, don’t roll it out to the curb until morning. I bag my water bottles separate and give them to the trash picker who comes through my neighborhood. There you go! A true Christian! What is the big deal, do they make a mess? Why not let someone turn the stuff in for money? 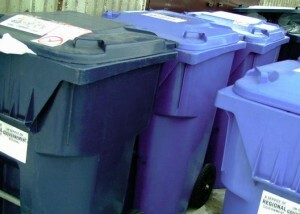 Do you think waste management gives us credit in lower bills for the money they get from recycled items? sorry I misread your response, I was wrong, that is a nice thing for you to do. There was a guy who used to scout our neighborhood a couple times a week. Looking over fences and walking up on driveways to look into open garages. I would see him at all hours of the day and night, thanks to video. 1 neighbor caught him stealing her family’s recycling from inside her yard and took pictures of him coming and going OVER her fence and loading her black plastic bags into his car. Her daughters took pictures of him and the car including license plates. Other neighbors caught him in their yards or their neighbors yard. Our neighborhood watch group reported this guy many times over a couple of years. He was stealing from us on an ongoing basis and when confronted, was quite hostile. We provided pictures to Public Safety and the LASD numerous times. His name is LaNiel Wilson and he was finally arrested and put in jail, not as a result of years of complaints from our neighborhood, but a complaint by someone who saw him and thought he looked suspicious. Apparently, the items we had reported him carrying around, we stolen. hmmm go figure! I was basically homeless at a certain point in my life, not going into details but had I been left with no food, no money and nowhere to turn, collecting recyclables was one of the few options I knew I might have to put something in my stomach, it would have been humiliating, but less humiliating then begging. I would have starved before I begged, stole, or dug disgusting food out of the trash. I do not believe this thief is a typical example of the type of person looking for recyclables on trash night, I believe this person was a thief who used the guise of collecting recyclables to steal from people. I own my house now, I only mention this in-case someone wants to start bashing my social status, I am mortgage free and did not obtain my status from marrying some rich man, though through it all I am still the same person with the same morals and values. I responded, however, it is being moderated. I meant I misread your initial response, my bad. I saw something on the teevee recently that said ‘waste’ is a human construct. In nature, everything is recycled. Ask the dung beetle. The packaging is getting better with plastic bags instead of plastic canisters for some products. But, I hate those sealed clear plastic packages that have to be cut open for things like a set of scissors. Ironic. A can opener works on most of those plastic packages. Not a bottle opener and not an electric can opener. WOW! Really, the people of the AV never cease to amaze me in their pettiness. God forbid (because this is one thing God hates) the poor profit from your garbage! I’ve recycled for years, but it irks me that the green can attracts diggers like a magnet. Why should I bother to sort the recyclables only to benefit some deadbeat can jacker? I think I would rather bury the goodies under the used cat litter these days. People who dig for recyclables are car jackers, wow this is good to know, I would have thought people searching for recyclables were trying to find an honest way to turn in stuff for $ so they didn’t have to resort to stealing.